The Fw-190 was so good that when the RAF got their hands on one in June 1942, it directly influenced the design of what would become the Hawker Fury, and also influenced Robert Hall of Grumman in the design of the F8F Bearcat. 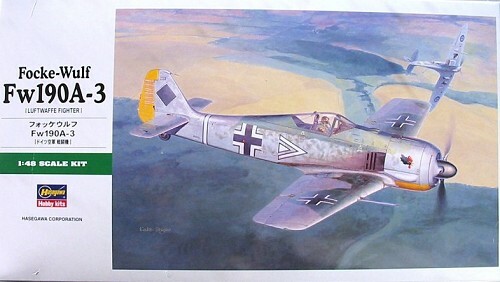 When it appeared on the Channel Front in late 1941, the Fw-190A immediately established a superiority over the Spitfire that it would maintain for the next two years, and enabled two Luftwaffe Jagdgeschwadern to hold off the entire English-based RAF on the Channel Front for 18 months. British losses of Spitfires in fighting the Fw-190 in the Spring of 1942 approached the level of “Bloody April” in 1917. In 1942 and 1943, the Fw-190A-3/A-4 was very likely the best piston-engine fighter in the world. The only other worthwhile Fw-190A-3 in 1/48 was released ten years ago by Tamiya, and that is a kit that - while it excels in “buildability” - has some real accuracy issues, most prominently the too-short landing gear and incorrect wheels. 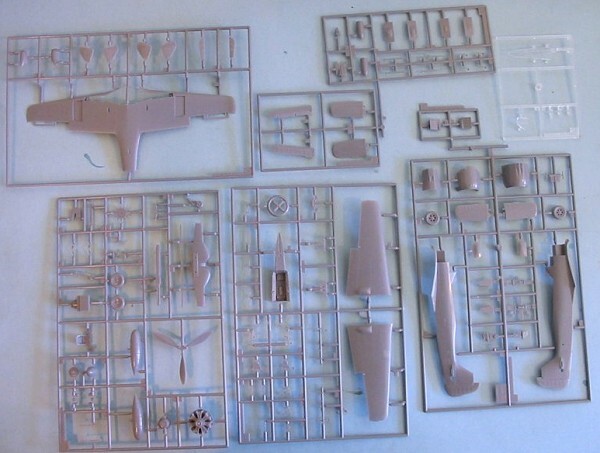 This new kit by Hasegawa obviously owes much of its basics to the original Trimaster Fw-190s, but it has been re-engineered to get rid of most of the “bugginess” of the Trimaster/DML kit as regards design engineering. Most prominently, the fuselage now has a “false floor” beneath the cockpit which insures the fuselage is wide enough to meet the wing without having to have pieces of sprue used as bracing to force the fuselage sides out to their proper position. Additionally, the cowling has been re-designed to allow better assembly and a more positive connection with the fuselage than one gets with the earlier kit. Most importantly, Hasegawa has imported the design of the landing gear attachment from their 1/32 kit, so that modelers will really have to put effort into misaligning the main gear - the one place where most Fw-190 models fail (I cannot count the number of beautifully-painted Fw-190 models I have seen dismissed from competition in the first pass of judging for this fault - everything from having the landing gear mounted straight down to having one wheel a scale foot ahead of the other). Fortunately, they did not import the dropped flaps. Myself, I think the cockpit is a bit under-detailed, but when one considers how really little there is to see of an Fw-190 cockpit once the fuselage is assembled, this will only be a problem for serious Fw-190 puris ts (and I am definitely in that category). The kit has also been re-engineered overall for fit. It’s really more like they did a shrink-down of the 1/32 kit than that they fiddled that much with the Trimaster/DML kit. Two sets of markings are included, one for “Assi” Hahn when he commanded II/JG2 in 1941-42, and the other being “Black 13" of JG2 with the stylized Eagle marking over the exhaust. 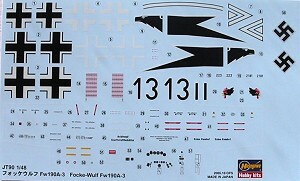 Given the plethora of aftermarket decals available for the early Fw-190A, a modeler will have no trouble coming up with an interesting model regardless of which version you decide to turn the kit into. Personally, I think the 1/32 Fw-190s are the best Fw-190 series available, but if Hasegawa continues this series in 1/48 - and all indications from the kit are that they will - then this Fw-190A-3 is the first of the definitive series of 1/48 kits. Thanks to HLJ - - for the review kit.